Honestly one of my favorite things in the world is exploring coffee shops in the cities I travel to. 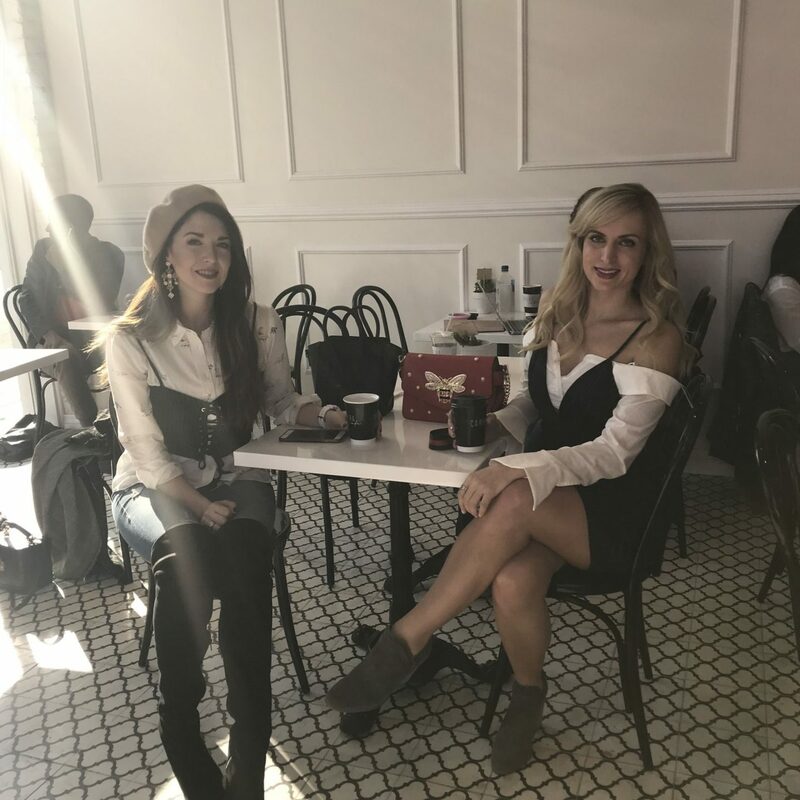 Los Angeles is particularly unique because there are so many great coffee shops that are also incredibly beautiful & yes, I’ll say it, instagrammable. 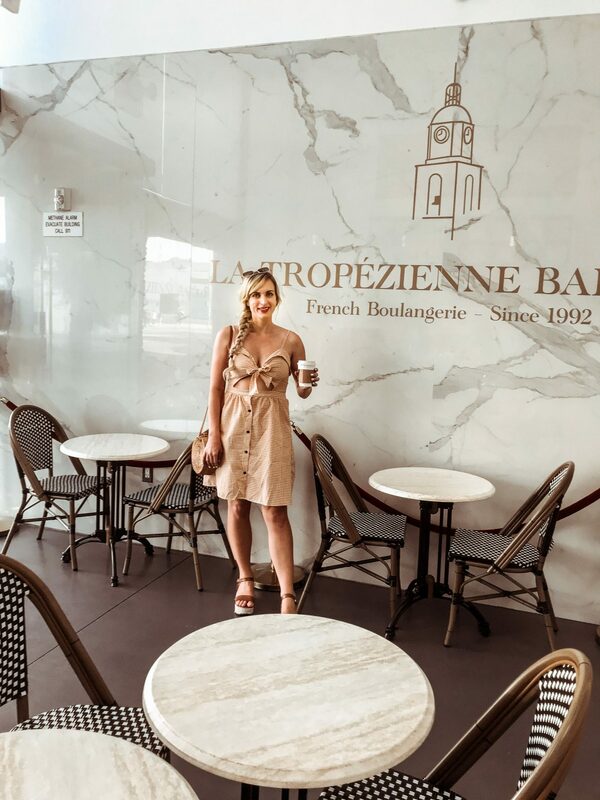 Having just got back from another LA trip, I figured now would be a great time to bring you my list of the most Instagram-worthy coffee shops in Los Angeles (that also serve great drinks and food!) Make sure you read this list before your next visit to Los Angeles! Dots Cafe is the new kid on the block and they are an instagrammers dream! 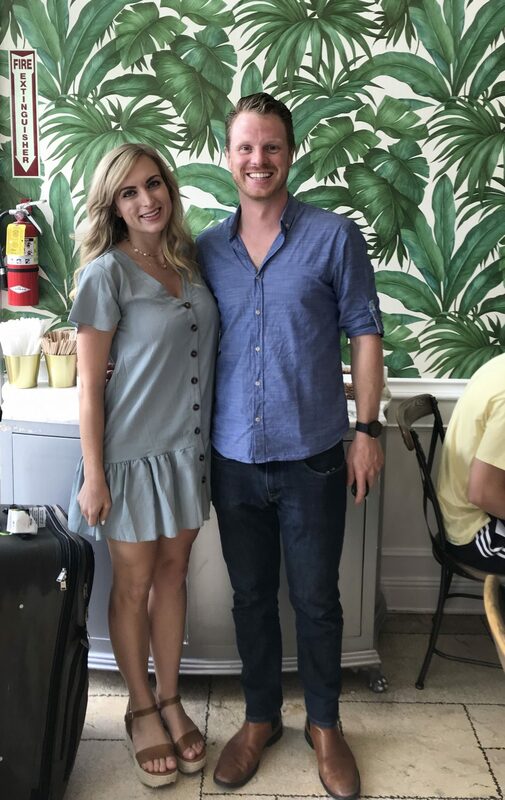 They are known for their cupcakes but also have a ton of delicious food (try the avocado toast) and drinks. 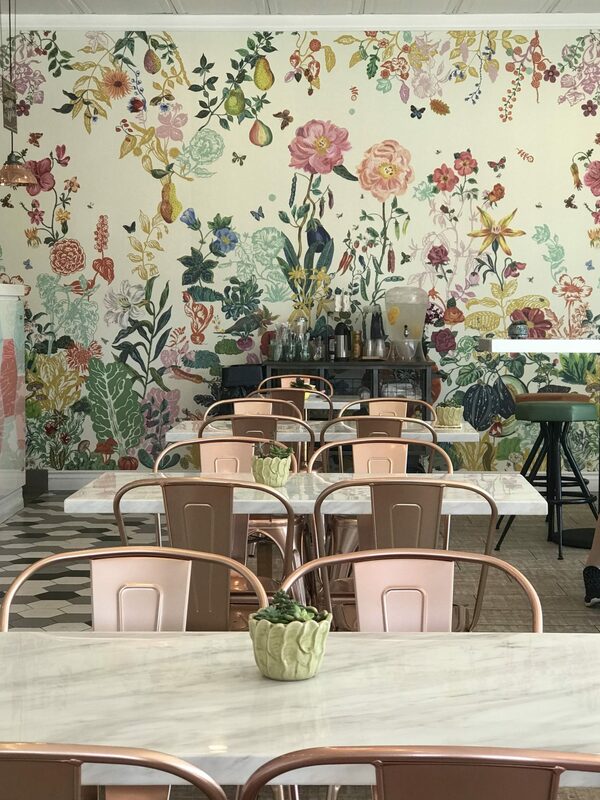 The inside of Dots has the most beautiful floral mural as you can see, and around the back of the building is this gorgeous wall mural. 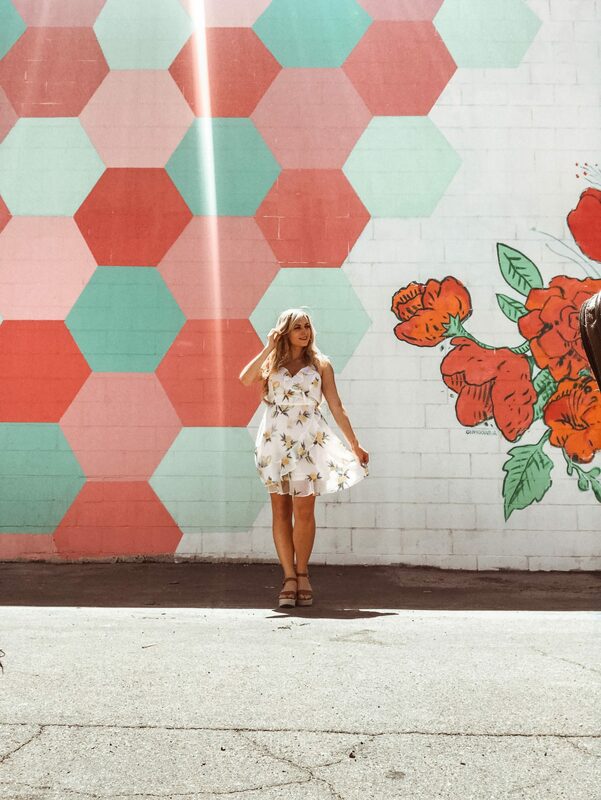 So many great instagrammable spots. Currently they’ve also got some fun balloon arches up in store; but I don’t think that will last too much beyond their grand opening. This European style cafe is everything you want in a bakery and an instagram worthy spot. The marble countertops and rattan chairs scream European flare and the patio out front is perfect. Also, the nutella croissant is freaking amazing; make sure you try it! 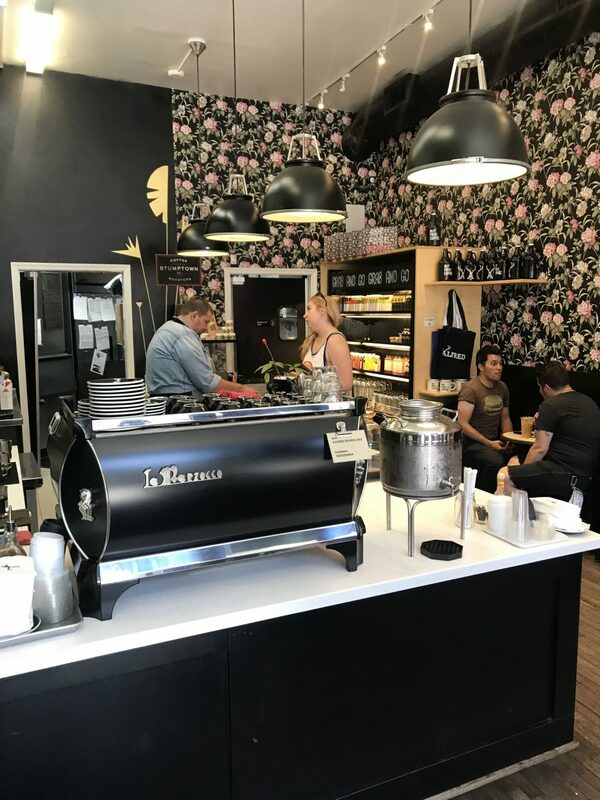 Carrera Cafe is one of LA’s most well known coffee shops and definitely deserving of the title of one of the most Instagram-worthy coffee shops in Los Angeles. 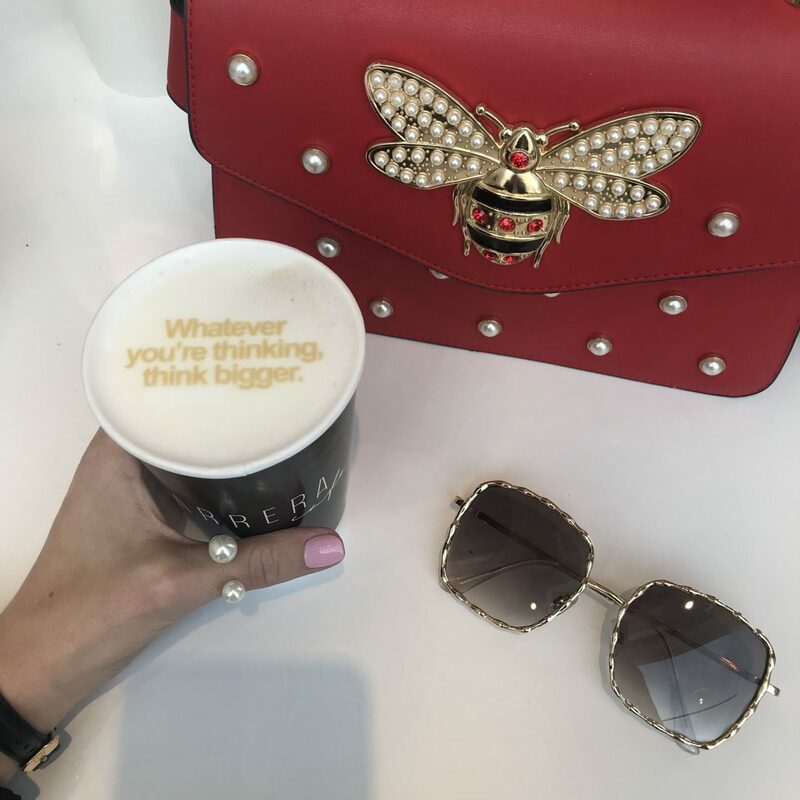 The black and white decor itself makes for a stunning backdrop but the real draw here is that you can get custom latte art of anything you want. Download the app “coffee ripples” and then you can upload any graphic/image and submit when you place your order. Voila! Completely customized latte art. Every cafe in the Alfred franchise has incredible decor, and I love that they are all so different from one another. 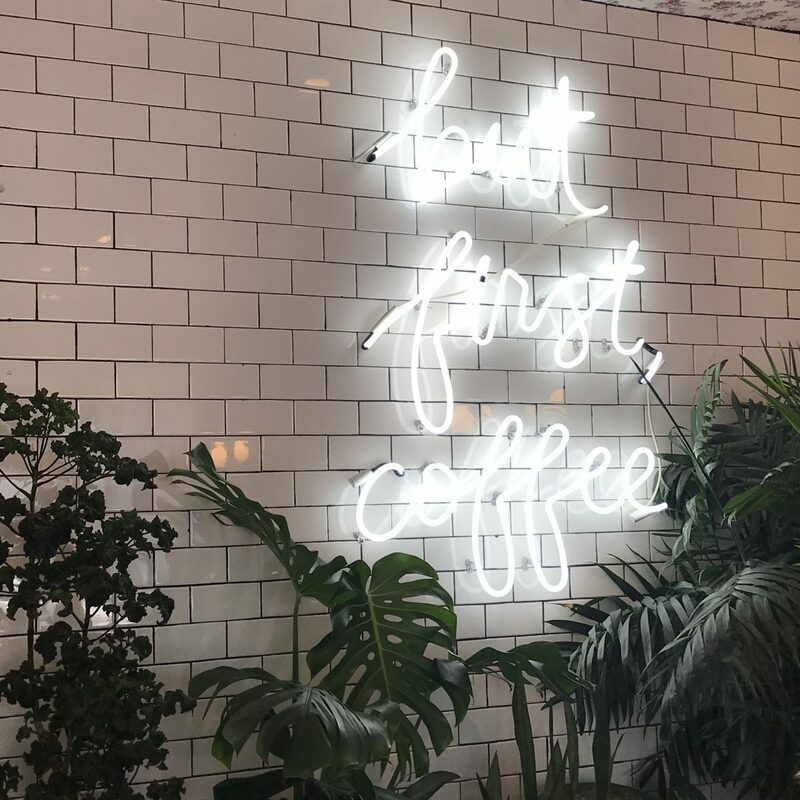 In my opinion though there are 2 that are particularly instagram worthy and Alfred’s Beverly Hills takes top spot as the location that is one of the most Instagram-worthy coffee shops in Los Angeles. The Beverly Hills location has a beautiful patio & the infamous “but first coffee” neon sign. 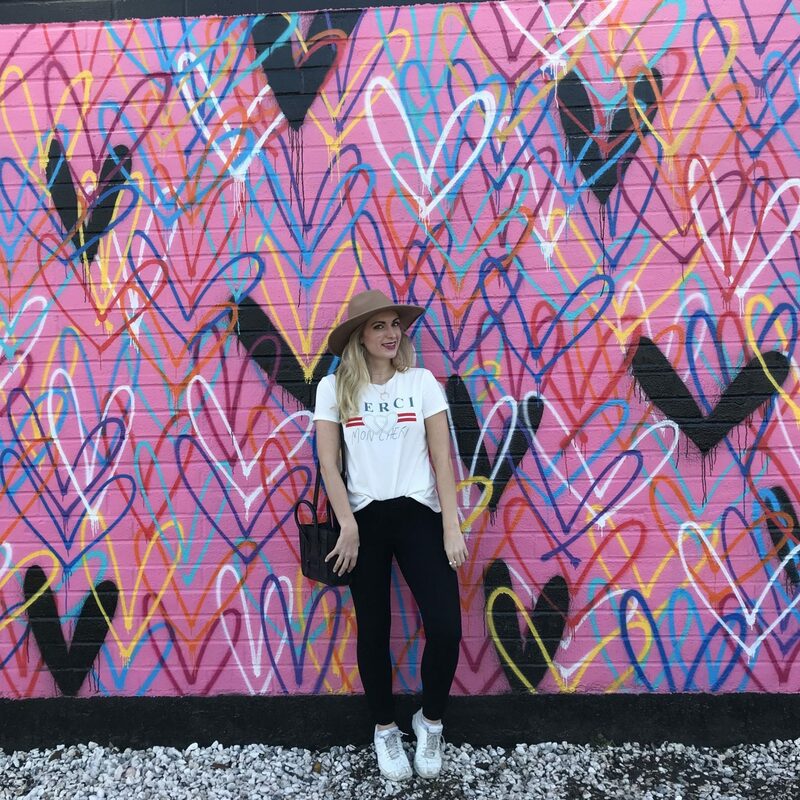 Around the side of the building is this fun instagram-worthy heart wall. The other Alfred cafe that makes my list of the most Instagram-worthy coffee shops in Los Angeles is the Silverlake location. This one has the most edgy decor – the dark rose print wall and black furniture is so chic. I also really love the drinks – the chaga-chino is a powerhouse of health benefits but tastes amazing. 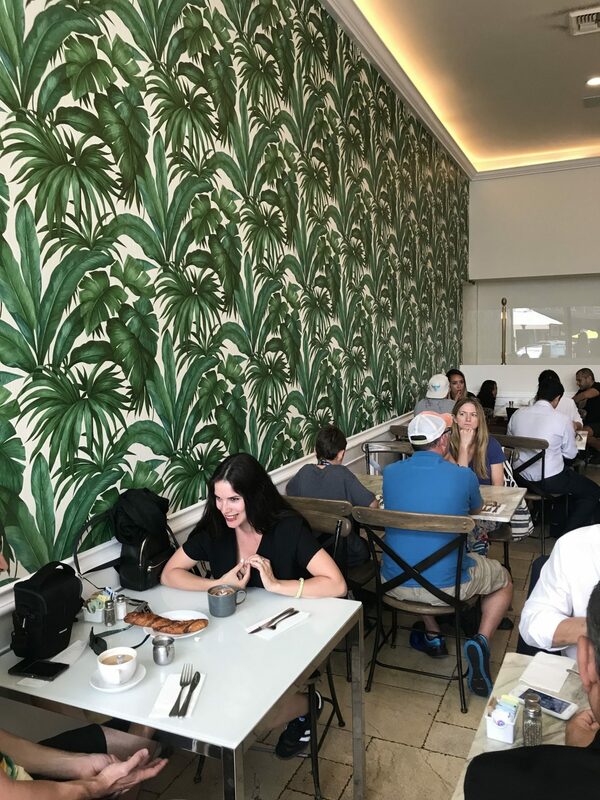 This Beverly Hills hidden gem has great coffee and tropical decor. 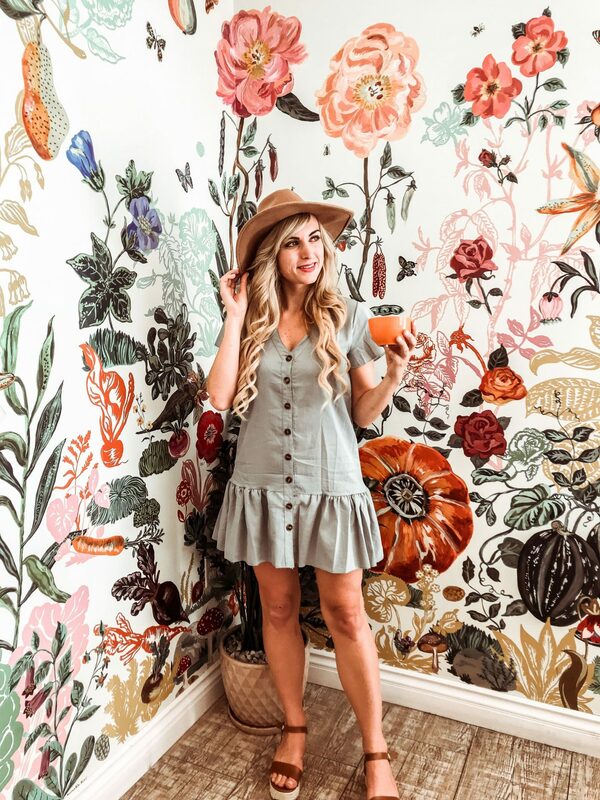 The palm print wallpaper makes for the perfect backdrop for all your instagram needs. 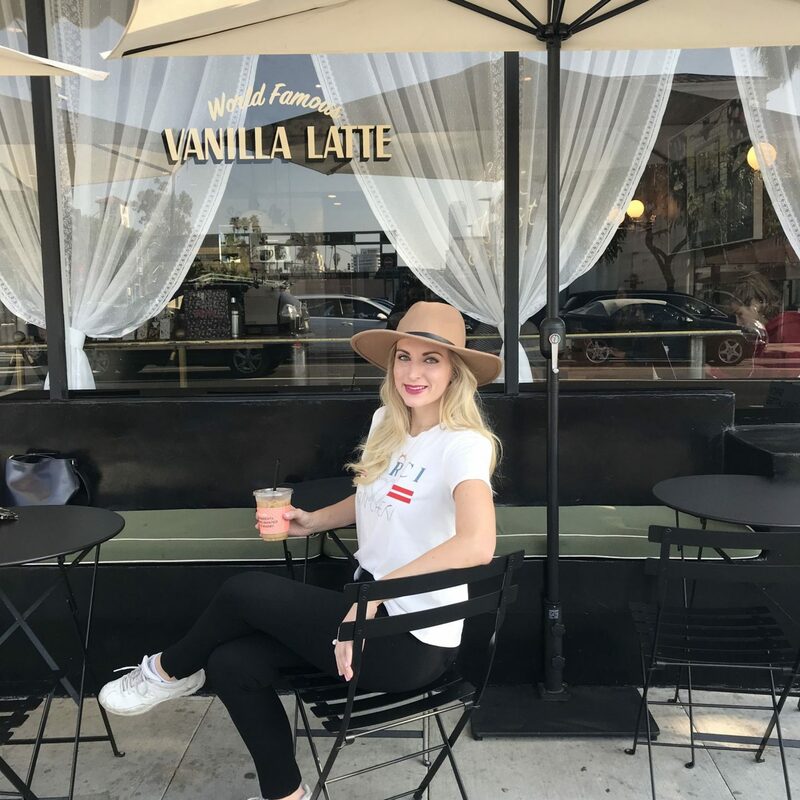 There is also a small patio out front if you want to get some fresh air and take a break while shopping till you drop in Beverly Hills! And that’s it! I hope you enjoyed my round-up of the most Instagram-worthy coffee shops in Los Angeles. It was hard to narrow my list down to just these 6, but I think these 6 offer you different styles that are all completely worthy of the gram. If you’re looking for more though; honorable mentions go to The Butcher, The Baker, the Cappucino Maker and Alfred’s Melrose location! "Fitting Room Reviews | Weekend Wear (NSale)"
"Faux Wrap Pencil Skirt – Day to Night"
Aw thank you so much! And same here! LA is so full of them! This is such a fun post! 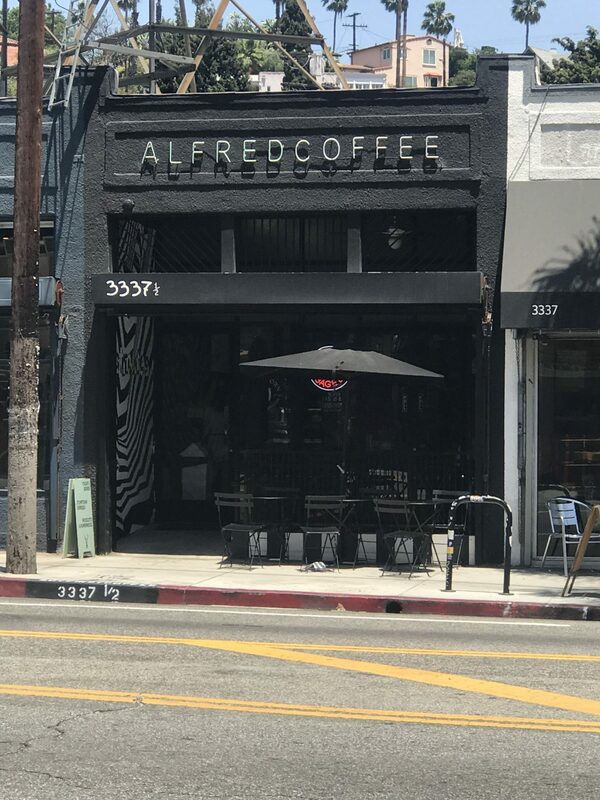 One of my favorite coffee spots in LA is Alfred’s but it looks like I need to do some more exploring next time in in town. So many adorable spots on this list! Thanks Katie!! And yesss I love all the Alfred’s (clearly haha) I just didnt want to only include them. But they are all SO good! 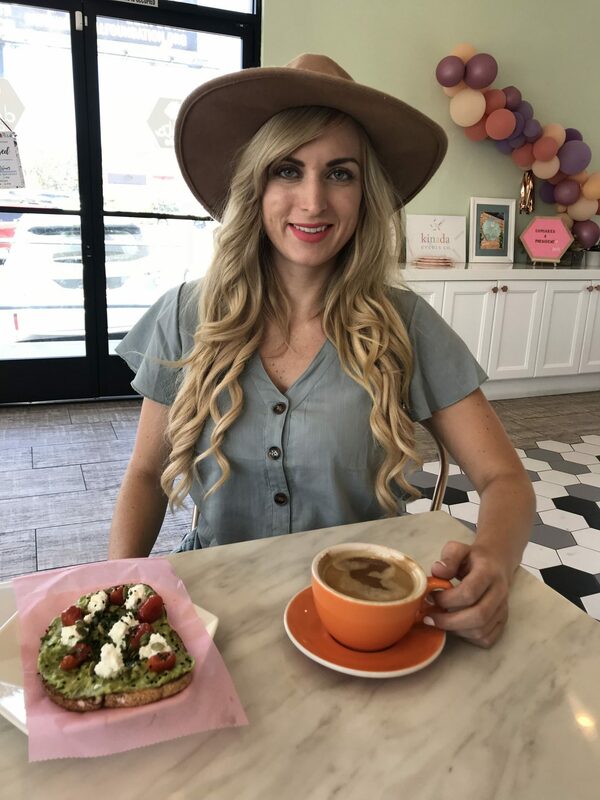 There are so many cute spots in LA! I’ve been to Alfred’s but not the others. I’ll have to put them on my list next time I’m in SoCal! Agreed! LA is an instagrammers dream haha. That first cafe is absolutely stunning with the floral background. I think LA is made for instagrammers! Isn’t it gorgeous! It’s new and not well known yet; but I’m sure it will be blowing up in popularity pretty soon! Oh this is so cute!! Thank you for sharing! Aw thanks Laura! Glad you like it! What I love so much about this guide is that I’ve only heard of Alfred Cafe before, meaning you nailed it with recommending places that are more unique and aren’t overly talked about! La Tropizienne seems to be exactly my style. Now my list of places to go to next time I’m in LA is increasingly better. Thanks for these great recommendations Lee! I hope you’ve had a great start to the week. Thank you so much, that was exactly my goal!! I wanted to find more ‘hidden gems’ to share with people. La Tropizienne is definitely great; very European. I hope you can check it out when you’re in LA next! Hope you’re having a great week as well! I’ve never been to LA, but I’m totally bookmarking this post for a future trip. Thanks girl! Glad you liked the post. What cute places! I can’t believe you can upload a pic and get the latte art of your choice. That’s so cool!! Love this list, I will have to check these places out next time I’m in LA. Isn’t that amazing!! I may have ordered THREE lattes all with different latte art…. lol. How stinking cute! Def bookmarking this post for my next trip out west! Oh my gosh that’s so cool! If I wasnt fashion blogging, coffee/ coffee shops would be the other topic I would want to instagram about. I’ll definitely check her out! 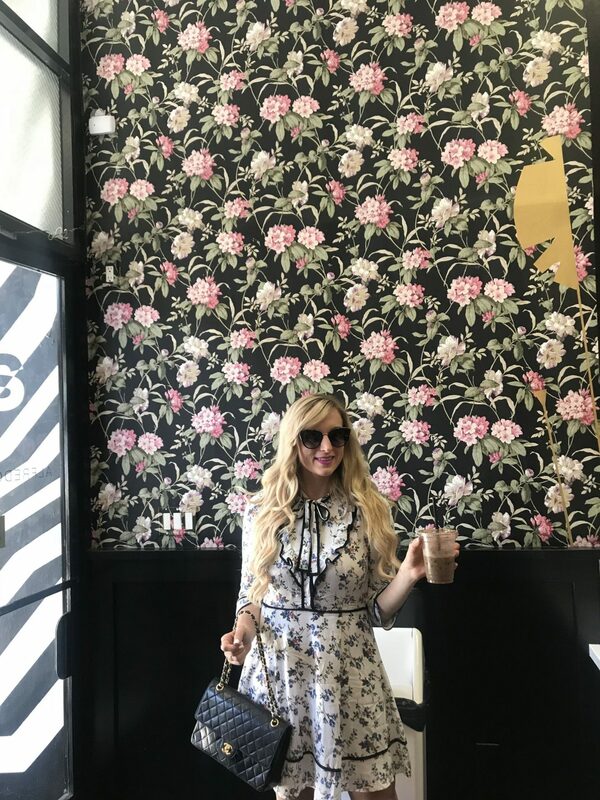 Those are THE cutest coffee shops- I’m sure LA is filled with tons of Instagrammable places. I’ve never been but it’s on my list! You definitely need to go! So many great places.